Jaybird X3 review | What Hi-Fi? One of the problems with wireless headphones is how to make sure they don’t fall out of your ears. As they house extra electronics and a battery, only the boldest just sit in your ear like a normal IEM (in-ear monitor). We don’t want them falling out mid-walk after all. The Jaybird X3s go further than most, with one of the most secure sets of ear hooks going. Sound-wise, though, we think you can get more for less money. At first glance, the Jaybird X3s look just like your average pair of wireless earphones. They have chunky earpieces with a cable joining them together, and a remote by one side. However, they have a few special features, making them a smarter design than most. The ear hooks they use to stay firmly lodged in your ears are very effective. Stiff at the base and flexible up top thanks to a honeycomb-pattern cut-out, a pull upwards makes them pop out of your ears easily, but an accidental yank down won’t. The Jaybird X3s are also rare in rejecting the usual rubber-bung micro USB charge point. Like a fitness tracker, these earphones come with a dock that clips onto four metal charge points on the back of the remote. Lose the dock and you’re stuffed but it takes away the main ‘human error’ point for water to get in and ruin the earphones. Not everyone will love the Jaybird X3s’ style, though. The hook and tip combo fills your ears, with a feel not that far removed from a custom-fit in-ear monitor, although this does provide better-than-average noise isolation. The tip style is odd too. Instead of a lip on the aperture to keep the silicone tip in place, the Jaybird X3s use a sort of ridged cone. If they’re not pushed on firmly, the tips fall off easily. The design may be like this to improve water resistance, as the aperture is large for a pair with 6mm drivers. Fit and ruggedness are at the heart of the Jaybird X3s’ design. Other than solid Bluetooth reliability and a reasonable 8-hour battery life, the tech isn’t at the forefront. There’s no aptX or NFC support, for example. The Jaybird X3s’ sound is slightly treble-led. There’s real zest and energy, favouring clarity over booming bass. They low-end does have a good degree of punch to it, but those who prefer their bass to slap them round the face may find it a little reserved. Instead, the X3s are clean and clear, with good treble detail. Those sensitive to sharp treble may find it a bit much, though. The Jaybird X3s are not outright sibilant or harsh, but they skirt close to it, and there’s a certain granularity to the higher frequencies that isn’t entirely easy on the ear. Haters of bright headphones should think twice. 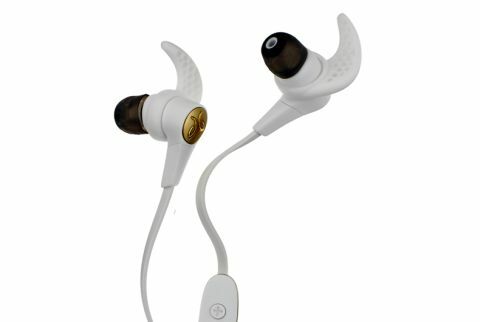 At this price, the Jaybird X3s could do with a little more refinement and texture in the mid-range. The Beyerdynamic Byron BTs have a smoother, more characterful mid-range, making the Jaybird X3s sound a little cold in comparison. Rhythm and dynamics are solid, though. The Beyers aren't perfect but do offer a more engaging, richer sound for less money. The Jaybird X3s have some clever features that stop them from being prone to water damage or being ripped out of your ears. As such, they’re good for active types. Their sound quality is solid and energetic, but a richer sound can be found for less money. Good for fitness freaks, but only decent for the rest of us.